Looking for a 10 channel radio system complete with on board telemetry? The Turnigy TGY-i10 has arrived! The TGY-i10 is bursting with features which are perfect for the modeller who requires maximum control and real time telemetry. The TGY-i10 uses 2.4GHz AFHDS 2 (automatic frequency hopping digital system 2) which spans the whole frequency band. Equipped with a high sensitivity receiver, this radio system guarantees an optimal and highly secure link between the transmitter and receiver. The innovative design of the new TGY-i10 makes the handset extremely lightweight while the menu items and data is presented on its 3.55 inch TFT touch screen! 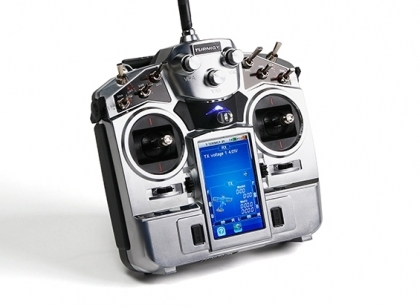 The TGY-i10 radio system uses high gain, high quality multi directional antennas, each transmitter has a unique ID, when binding, the receiver saves that unique ID and will only accept signals from the transmitter it is matched with, this prevents interference from any other radios and ensures the safety of your model. The TGY-i10 radio system utilizes extremely efficient components and high speed processor chips for those complicated mixing settings. In comparison this radio system uses 1/10th of the power of a standard FM system. Another key feature of the TGY-i10 is its telemetry capabilities, the radio system has the ability to monitor real time rpm / voltage and temperature data which provides added security when flying your models. If you require more than 10 channels an i-Bus receiver (TGY-AEV01) is included, which will provide you with an extra 4 channels which allows an additional 16 servos to be connected. The TGY-i10 really is one of the most intelligent and innovative radio systems available today and all at a price that will not break the bank! channel offset, trim / subtrim, throttle down / curve / delay / reverse, system menu, model name, timers etc. Airplane / Glider functions: Aileron / flap / spoiler, elevator to flap, butterfly, V-tail, dual elevator etc. Helicopter functions: Throttle hold / mix / curve, pitch curve, swashplate mixing / type / ring, governor, gyroscope etc.